By Jason Davis – WASHINGTON, DC (Mar 22, 2019) US Soccer Players - Major League Soccer is taking the FIFA international break... to a point. While most of the league will be off through this week and into next, 10 teams have games on the schedule. That, quite naturally, means 10 teams will be dealing with key absences when they hit the field for matches that matter. Never an ideal situation, the forced rotation will at least give these clubs a chance to test their depth early in the year. That’s a dull silver lining, but it’s a silver lining nonetheless. Hardest hit by the international window might be Columbus. They'll be without American internationals Wil Trapp and Gyasi Zardes, as well as Iraqi international Justin Meram and Jamaican fullback Waylon Francis. Trapp and Zardes are two parts of the Crew’s spine. They're the deep-lying playmaker and leading striker in a team that started the season strong under new head coach Caleb Porter. Porter hasn’t changed much about the way the Crew play after taking over for Gregg Berhalter. His team will feel the loss of Trapp and Zardes. MLS veteran Ricardo Clark, a player with more than 350 MLS appearances on his resume, will step into Trapp’s role. Porter has a choice between Patrick Mullins and JJ Williams at striker. Mullins is a veteran with 24 goals in his six seasons while Williams is a rookie yet to make his debut. Columbus takes on the Union in Chester on Saturday. Philadelphia will be without midfielder Derrick Jones, away with the US U23s, and striker Corey Burke called up by Jamaica. The attacking burden will remain on Mexican Marco Fabian with David Accam and Fafa Picault in support. The Union doesn’t have any excuses against Columbus. The start of the season hasn’t gone to plan, but they can't waste a chance to grab three points at home against a weakened Crew team. Elsewhere, it’s the Red Bulls who have a big hole to fill caused by an international call-up. Whatever the drama surrounding Paraguayan playmaker Kaku in Harrison, the midfielder is always a presumed starter when New York takes the field. The FIFA window has Kaku away with his country, forcing Chris Armas to make a change to the balance of his midfield again Orlando. The man most likely to deputize in Kaku’s place was Florian Valot, but a season-ending knee injury now opens the door for 20-year old Omir Fernandez. Fernandez has already shown flashes of his ability in the early going of 2019. He scored in the Concacaf Champions League against Santos Laguna. If Fernandez shows well against Orlando and earns more playing time in meaningful matches from Armas, he’ll be just the latest in a long line of Red Bull academy products to make the leap into the spotlight at the senior team level. He could also help simplify the situation around Kaku. If Fernandez is ready to raise his game. Kaku might be more expendable when the transfer window opens. There are a few months to weather, but there is a resolution in sight. As long as Club America, or some other interested club, comes in for Kaku at a number the Red Bulls will accept. FC Dallas will also turn to youth to cover for the absences of Bryan Ruiz (Honduras) and Carlos Gruezo (Ecuador). Jesse Gonzalez is available. FCD is rich in young midfield talent and can also push 2018 signing Pablo Aranguiz into the starting lineup. Paxton Pomykal’s emergence gives coach Luchi Gonzalez flexibility despite the international window. One of the clubs sitting out the weekend is Toronto FC. The Reds started the season strong with a pair of wins, including a dramatic 3-2 victory over New England last weekend. That game was notable for the return of Jozy Altidore from injury. He subbed on and scored the game-winning goal. Altidore remains one of the league’s top strikers. The success of TFC in 2019 relies heavily on his contributions. Last year’s precipitous drop-off following the 2017 MLS Cup-winning campaign was due to many factors. Those included the early and heavy push in the Concacaf Champions League an a host of injuries in the back line. The limited amount time Altidore was on the field might have been the biggest reason why Toronto fell so hard. TFC will also get a boost post-international break when Alejandro Pozuelo arrives in the team. Following a protracted and painful transfer process that required Toronto to pry the Spaniard from Genk in Belgium, Pozuelo arrives in Ontario with plenty to prove. If he’s going to be worth all the trouble, he’ll need to fit in quickly. 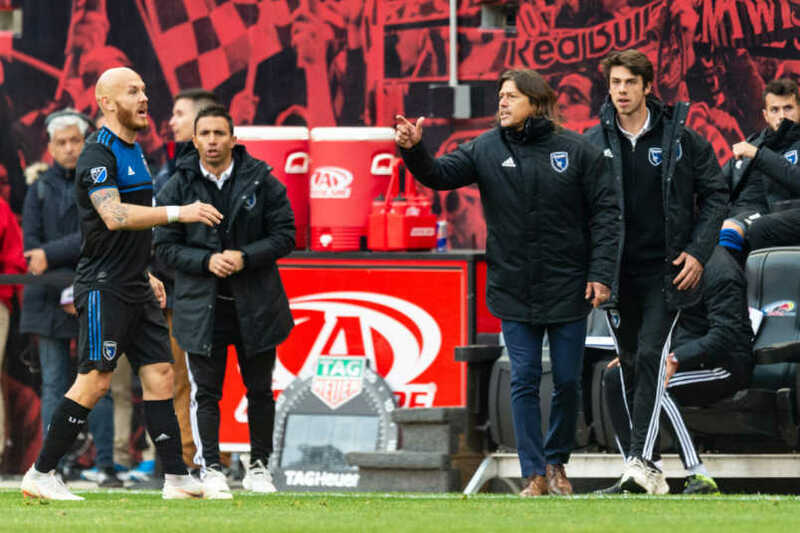 San Jose will also have the week off from competitive matches, but that doesn’t mean Matias Almeyda and his side won’t be working. The Quakes have played three times and lost three times. Their -7 goal difference is worst in the league. The two goals they’ve scored in two games ties for last in MLS as well. The revolution in Northern California hasn’t yet arrived. It might not be fair to expect an Almeyda-led revolution immediately. The Quakes didn’t do much to address the roster deficiencies over the winter. They moved into 2019 with essentially the same team that finished dead last in MLS in 2018. For all of Almeyda’s success in Argentina and Mexico, the level of players available relative to the rest of the league was better than what he’s working with at San Jose. Already there are low rumbling rumors that Almeyda is second-guessing his decision to move north. The Argentinian has a contract and probably isn’t going anywhere. That said, it's a different challenge he's facing in San Jose. That’s bound to lead to some real frustration. San Jose might not add another player before the primary transfer window closes. The irony for Almeyda is that San Jose went all in on the coach without doing the same with the roster. Operating on a self-imposed budget within the restrictive MLS budget rules is the issue. The Quakes looked ambitious without actually committing any real money to the team’s biggest problems.